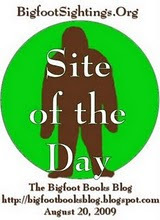 BIGFOOT'S bLOG: CREATURES SEEN by Seven-Year-Old Girl!!! 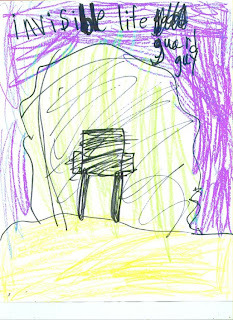 CREATURES SEEN by Seven-Year-Old Girl!!! "Loch ness monster seen at river behind fresh produce farm. 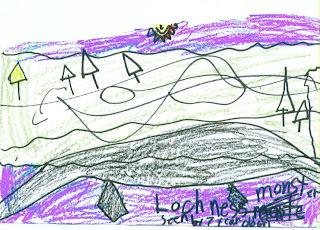 7 year old girl saw back of Loch ness monster. 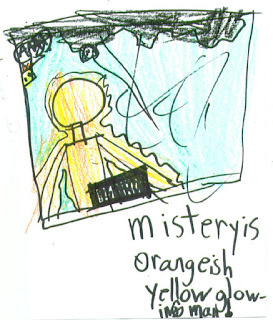 Mysterious orange-ish yellow glowing man seen at Steve Streufert’s house. 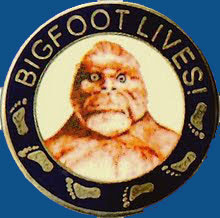 Big foot seen twice ." 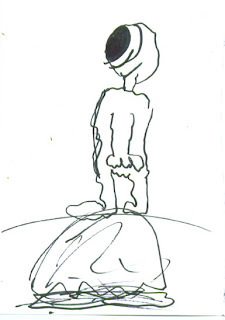 The caption of this drawing, of a sasquatch seen moving behind a firewood pile in the yard, reads "Bigfoot seen..., or just a dream." Other strange sightings have occured, as follow. A mysterious orange-ish glowing man (an alien?) was seen outside the cabin. A Loch Ness Monster type of creature (Kamoss, the Hupa people's river serpent?) was seen in a dorsal view, back moving above the water, on the Trinity River down behind Trinity Valley Farms off Highway 96. About a year ago she saw a brown solid orb flying through the air over the ridge south of the Patriot Gas station in downtown Willow Creek. She claims it was not a rock, airplane, balloon nor meteor. Her father did not see this one, but a few years back he and a number of friends did see a similar white orb moving across the valley south of Mt. Shasta while sitting up on the summit area of Castle Crags. These sightings prove that the strange and paranormal are alive and well in the Willow Creek, CA area, or at least in the imagination and dreams and unprejudiced mind of a young kid. Her dad didn't see them, but how easily can we dismiss these things? Maybe her dad is just a "gr'up"? Grownups DO need to open their minds to the mysterious and miraculous beyond normal, socially and culturally limited perception. Oh, and let us not forget the "Mysterious Invisible Life Guard Guy," spotted along the Trinity River. 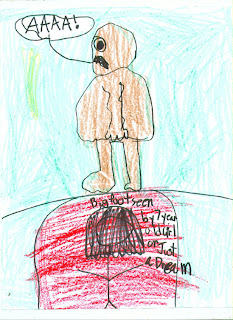 All Drawings Done by DENALI BROWN, 2008. These are some detailed and compelling depictions that Denali has done. I, for one, am convinced of their accuracy and veracity. She is a keenly observant and truthful person. I only wish I had been there to see these marvels with her! 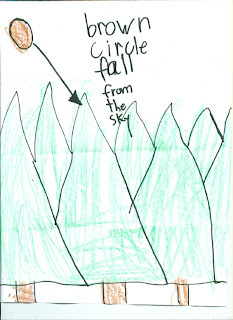 Denali's illustrations are very interesting and precise. I wish I had been there when she witnessed these marvels! Sometimes she says, Only kids can see them. Guess I was too much of a grownup, as I was there on some of these occasions.